Without Professor Charles Yanofsky’s discoveries in the field of genetics, scientists might never have understood the complex relationship between DNA and proteins and their effects on genetics. Charles Yanofsky, the Dr. Morris Herzstein Professor of Biology, Emeritus, died on March 16. He was 92 years old. Born in New York City, Yanofsky attended City College of New York but left to serve in the U.S. Army during World War II, where he fought in the Battle of the Bulge. He returned to finish his bachelor’s in biochemistry and then earned his master’s and PhD in microbiology from Yale. 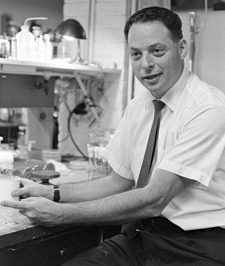 Yanofsky became an associate professor of biological sciences at Stanford in 1958. By 1961, he had become a full professor. 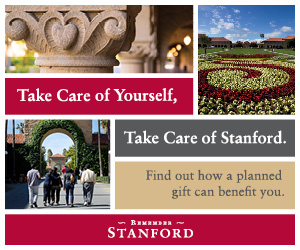 After inheriting biologist Edward Tatum’s lab at Stanford, Yanofsky and his colleagues published a paper that confirmed the colinear relationship between genes and proteins, referencing Tatum’s and biologist George Beadle’s experiments providing a detailed genetic map of mutations in a gene. He continued to search for basic information that would help understand gene expression in all living things. This research led to more discoveries, including how changes in RNA structure allow it to serve as a regulatory molecule in bacteria and animal cells. Yanofsky instilled in his students an excitement for the potential of science. His son Martin, a professor of cell and developmental biology at UC–San Diego, says, “My father lived, breathed and loved science. I remember him heading to work in the morning, coming home around 5:30, having dinner, and then going off to his study. Every Saturday morning, my mother and father and two brothers would head to our weekly feast at Harry’s Hofbrau. But before going to lunch, we always stopped at my dad’s lab so he could feed his fish. To this day, I don’t know if it was critical for him to feed the fish or if he just wanted to see how many of his students and postdocs were working on the weekend.” Yanofsky attended every Stanford basketball game and almost every football game for many years. Yanofsky was a member of the American Academy of Arts and Sciences, the National Academy of Sciences and the Royal Society of London. He received the Albert Lasker Award on Basic Medical Research and the Genetics Society of America Medal. He served as president of the American Society of Biological Chemists and of the Genetics Society of America. At age 79, Yanofsky was awarded the 2003 National Medal of Science. He is survived by his second wife, Edna; his sons, Stephen, Robert and Martin; seven grandchildren; and four great-grandchildren. His first wife, Carol, died in 1990. Julie Muller Mitchell, ’79, is a writer in San Francisco. Faculty weigh in on why we're so polarized.